If enabled, Echo allows you to specify courses from which content authors can copy activities as templates. They can then edit them for their own needs. From the Domain Details, select Domain Settings. The Order you want each added item to appear in ("0" = top placement). The course you want authors to be able to copy templates from. Once added to the domain, these templates appear under tabs along the top Add to window when adding an activity with the Editor. Echo is constantly being improved based on the feedback from users and we strive to keep our documentation up to date. If this document doesn't match what you are seeing in Echo, please let us know. How do I create badges? 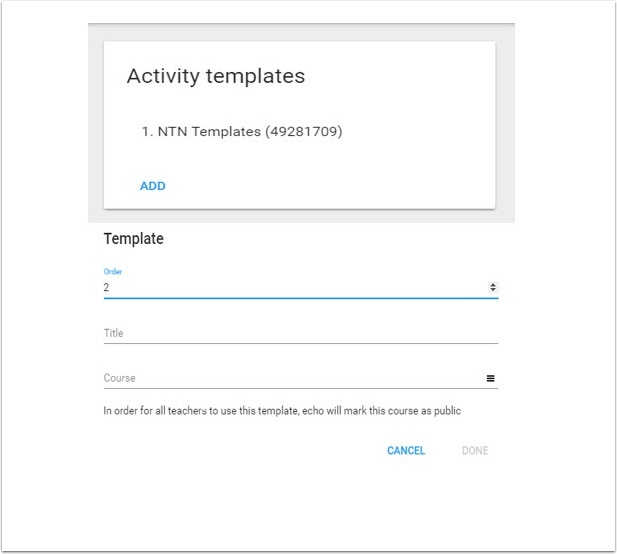 How do I create and use activity templates?